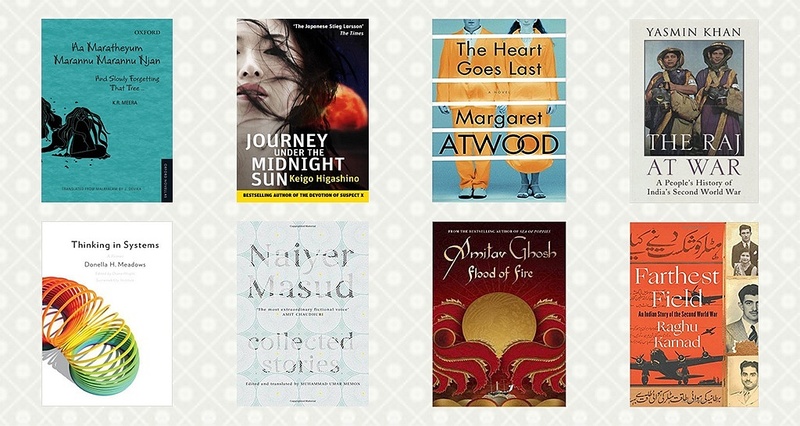 Some of the books that stood out for us in 2015. A disclaimer: some of the books were published before 2015. And Slowly Forgetting that Tree by K.R. Meera: Malayalam writer K.R. Meera’s haunting novel is a story of betrayals, trauma and loneliness. A fabulous work by one of the leading voices of our time. The first translated collection of Masud’s stories is hypnotic and surreal, revealing a master at work, and establishing him as one of the most original voices in world literature today. Writing as only she can, Atwood delivers a magnificent punch to the story of a couple trying to stay afloat amid a future of social and economic collapse. The mysterious Ferrante delivers her final book in the Neapolitan series, and confirms her reputation as one of the world’s best living storytellers. Higashino’s most popular book in Japanese was finally brought to English-reading audiences this year, and it was worth the wait. A brilliantly told mystery about a boy and a girl whose pasts and presents collide interminably. Crime fiction of the year. Doerr is a master at his craft, and there is no better evidence than this World War II novel. Sublime, evocative, and beautifully written. An extraordinary first novel that combines philosophy, mathematics, the financial crisis, the War on Terror and personal histories, this is one of the great novels that defines the 21st century. Adichie’s third novel builds on her reputation as a master storyteller, and she returns with a bang in this wonderful novel about race and identity in the 21st century. The final book in the Ibis trilogy completes the story of the Hind and its many passengers, with the ship docking in Hong Kong just as war breaks out between China and Great Britain. An exquisite novel about a contemporary marriage, Light Years was first published in 1995, but reissued recently. An instant classic. A gothic YA novel that should be read by everyone, The Lie Tree takes the reader to an extraordinary garden where the tree exists, only growing when someone whispers a lie to it, and in return receives an immutable truth. An impressive debut from a young writer, Farthest Field fills in the gaps in the story of India’s participation in the Second World War, so long concealed and hidden away from the world. 2015 was the year when India began to confront its massive participation in World War II, so far ignored and unreported. Khan’s beautifully written book narrates the stories of those who fought in it. Starr tells the fascinating and largely unknown story of Central Asia’s greatest minds who built a bridge to the modern world. This is the story of a civilization that has been lost to history, a tale about a forgotten age of enlightenment. Pioneering environmental scientist and one of the world’s leading systems analysts, Meadows offers us insight into problem-solving on scales ranging from the local to the global. Award-winning designer Moggridge tells the story of 40 influential designers who have shaped our interactions with technology. Called ‘fascinating, stimulating and illuminating’, this book has shaped the way we’ve thought of our product. First published in 1997, no other book has revealed the role doctors play in our society so closely. A meditation on medicine and humanity.